Lumbar puncture and radial nerve surgery. Artworks illustrating two surgical procedures. At left is a an incision in the upper arm made to examine the radial nerve in a case where the nerve and muscles have been lacerated and cut. The severed ends of the nerve have been tagged and loosely sutured together. At lower right, a patient is shown in the position used to take a same of cerebrospinal fluid (CSF), a useful but painful diagnostic procedure. 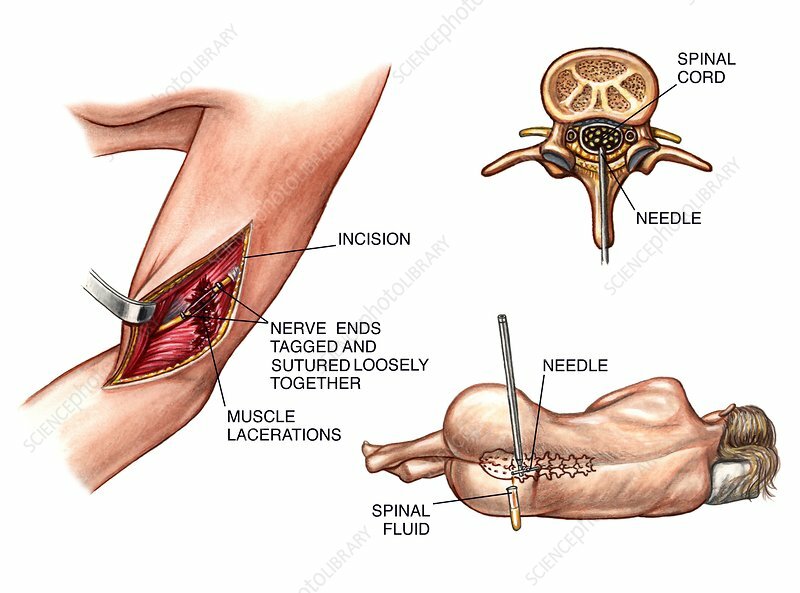 A needle is inserted into a lumbar vertebra (shown at upper right) and the resulting fluid collected for analysis.